The Calmac ferry to the Isle of Arran goes between Ardrossan and Brodick and offers the chance to see birds out in the Firth of Clyde on a trip that takes just under an hour each way. The ferry is big and only gets bumpy in really bad weather. There is outdoor seating on various decks for observing (it is even possible to look out of the windows in the cafeteria and observation lounge:-). On Saturdays during July and August the North Ayrshire branch of the RSPB have a stand at the rear of the ship to show passengers the wildlife en route (and do a very successful RSPB recruitment!). Ferry is equipped with lift to transport wheelchair users from car deck to upper deck. As the boat leaves Ardrossan harbour you get a decent view of Horse Island (NS213427). This is an RSPB reserve with a large colony of Eider and Lesser Black-backed Gull , with Cormorant , Shag and Greylag Goose . There is no access to the island, so the ferry makes a good vantage point. Ardrossan Harbour is also a good location for seeing Black Guillemot at close range. When in mid-firth the birds to look out for include Manx Shearwater and Storm Petrel (especially in autumn), Gannet (on fishing trips from Ailsa Craig), Fulmar , the three commoner species of Diver . As the ferry approaches Brodick you pass the refuse tip with its attendant gulls. In winter these are obviously worth scanning for white-winged gulls such as Glaucous and Iceland . The ferry is also good for other marine wildlife: e.g. porpoise, Atlantic grey seal, common seal, Minke whale . The Firth is also important for the enigmatic Basking Shark . 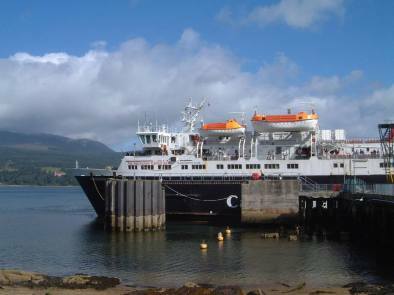 For more general information on Arran (e.g. ferry details) please see the Arran page. This entry was posted in Locations - North Ayrshire on 08-Oct-2010 .